The location is unbeatable, just off Graben. Very convenient when shopping! 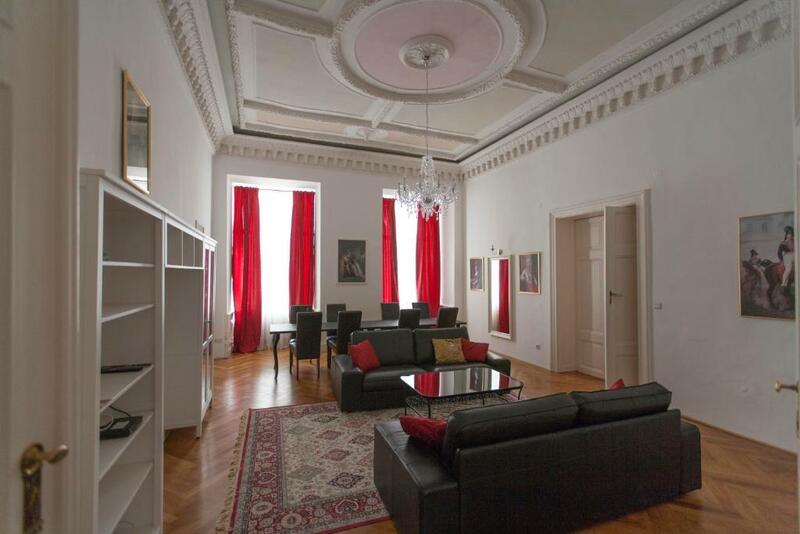 Also, the apartment has the old grandiose: ceilings are very high and it has ample space! Bathroom and kitchen have been updated. Super big apartment for a friends group. Awesome ambience. Location us excellent. It borders famous Hofburg palace. Ceiling are high - I would estimate not less than 5 meter. Very spacious. The location is pefect, all in walking distance. Room is very comfortable with all utensil provided. Some flyer, map and information also provided in the room. Spacious apartment. Great location if you have limited time.. good price and easy arrival/check-in process! 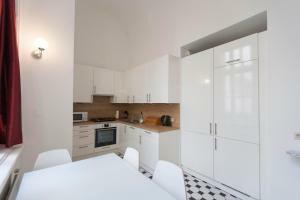 Excellent location.It was quiet, spacious and fully equipped, very close to undergrund stops, shops and restorants. 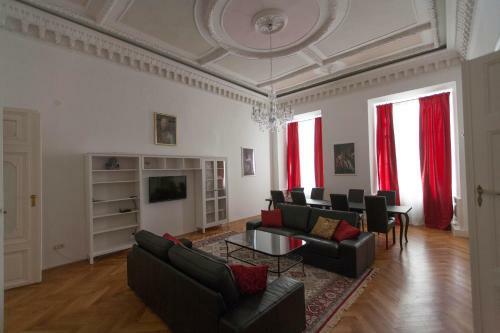 Right in the center, big rooms and high ceilings. Feels like dining in a palace. 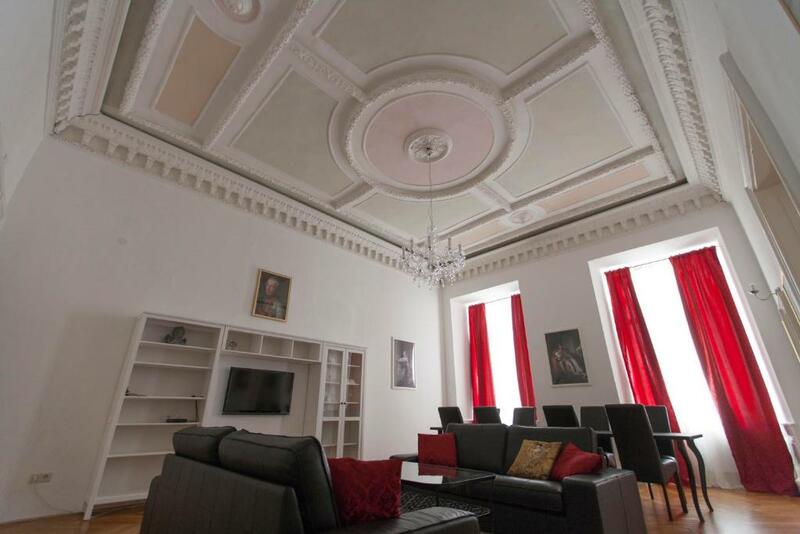 Great location, comfortable beds and very warm rooms! 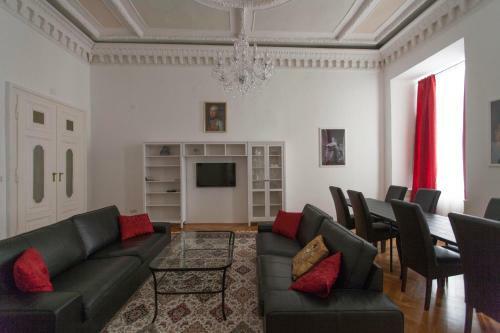 Heart of Vienna Luxury Residence enjoys a location in Vienna, just a 2-minute walk from Imperial Treasury Vienna and 900 feet from Austrian National Library. The Albertina Museum is within a 7-minute walk of the apartment. The apartment has 2 bedrooms, a fully equipped kitchen with a dishwasher and an oven, and 1 bathroom with a bath and a hair dryer. A flat-screen TV is available. Graben is 0.6 miles from the apartment. The nearest airport is Schwechat Airport, 13 miles from the property. 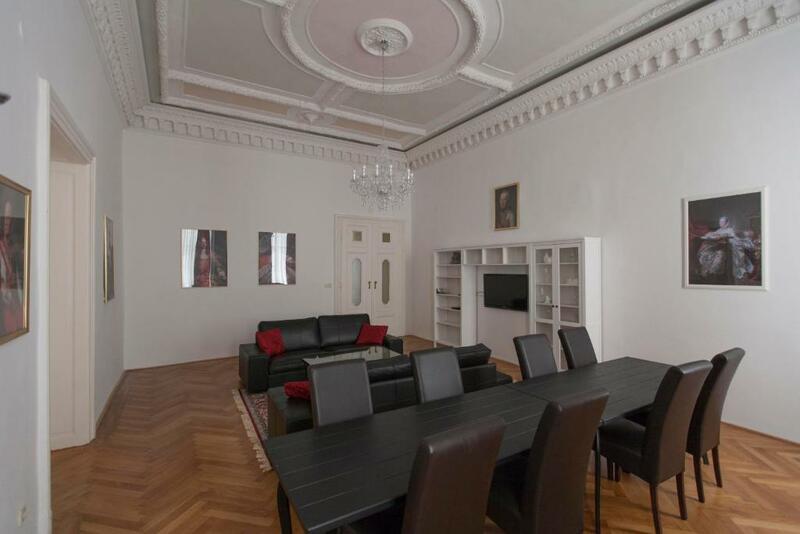 뀐 Located in the real heart of Vienna, this property has an excellent location score of 9.6! 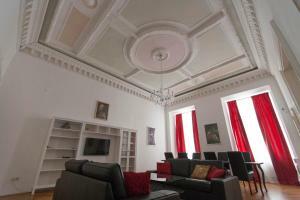 When would you like to stay at Heart of Vienna Luxury Residence? This spacious apartment features 2 bedrooms, a living room, a kitchen, and a bathroom. 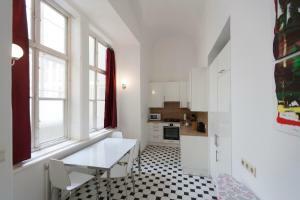 We have several holiday apartments in Vienna. They all are located extremely central, that is the advantage which we offer our guests. All the apartments are well equipped, clean and there is everything you need for a comfortable and pleasant stay in the Heart of Vienna! One of the most central walking streets in Vienna "Graben" is 2 minutes away from the apartment. Stephansdom is about 5 minutes walking. All the subway lines are very close to our location. House Rules Heart of Vienna Luxury Residence takes special requests – add in the next step! Heart of Vienna Luxury Residence accepts these cards and reserves the right to temporarily hold an amount prior to arrival. Please inform the property of your approximate arrival time at least 1 or 2 days before arrival, and also inform the property of any changes to this. Please note that this is an apartment in a residential building. There is no reception. Please also note that a hotel is located in the same building. The apartment is not connected to the hotel, and check-in does not take place at the hotel reception. 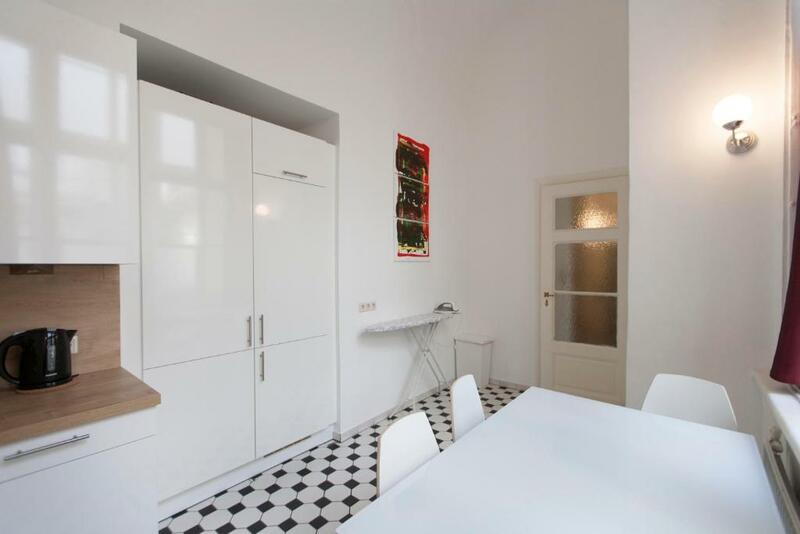 The meeting point with Heart of Vienna Luxury Residence staff is in front of the black doors at Habsburgergasse 5. Breakfast is available on request (1 day before) and at a surcharge in the hotel's breakfast room. Please note that parking in the courtyard is prohibited. There are only private parking spaces there. Please note that smoking is not allowed in the apartment. A cleaning fee of EUR 300 will be charged in case of violation of this rule. Please inform Heart of Vienna Luxury Residence of your expected arrival time in advance. You can use the Special Requests box when booking, or contact the property directly using the contact details in your confirmation. Room was dirty, urinal stains on toilet, dust everywhere, dried blood stains on bedside table.. Kitchen was dirty. Everything seemed like it hasn't been cleaned for ages. No direct communication with landlord possible. Not even through booking.com. Very unfriendly staff und no service at all. This is called a luxury apartment? Definitely not. Floor tiles missing in kitchen. No place to put amenities in bathroom. So you have to put everything on dirty floor. TV didn't work, our extra bed linens haven't been put on. We paid 381 euros for 2 nights! 70 euros are charged for cleaning, which has not been done. Obviously the landlords are no locals, because local people would rent out a tidy apartment and would be more service orientated. I work in tourist industry. This flat and service is totally in acceptable! Heater not working need to keep on reset. The pillow is too soft to sleep on. The room is not set up as I expect. the apartment was not clean, very dusty. beds were ok. kitchen floor had missing tiles.bathroom shower dripped all night. the apartment needs a dusting top to bottom. location was amazing. size was spectacular. Poor hospitality and poor service; During booking the apartment, double charge was applied. It took almost one month to get the money back. Early Check- In was not accepted. Early luggage storage was not accepted. Wi-Fi did not work. Owner was informed about the problem, but nobody came for fixing the Wi-Fi. Loose door handle. Bookshelf require repair. There's only one bathroom in this apartment to fit 5 or 6 people! For the first time in my life I am facing this situation to pay bigger fee for cleaning in comparison to the price per night! I slept in the apartment only one night and the price was around 68 euros... ang guess what ?!! I paid addition 70 euros ONLY for the cleaning service! Is thi normal ?! I consider this like a fraud. For sure I will not use this company again. And not only I have paid this additional 70 euros, but the apartment was not clean at all... they didnt even empy the trash bins, under the bed was full of dust... come on guys... and you want more for cleaning that the cost of one night stay?!! the gap in the floor of the kitchen. Thr rest of apartment is old; doors and windows have fainted paint. Also, paying €70 for cleaning fee when the apartment is actually dirty is not acceptable. Had to email multiple times to ask for stuff that where missing, eg extra linens. A Nespresso coffee machine would have been nice! There was no hot water in the shower and bathroom sink especially when the temperature is -1 degree celsius. The kitchen was cleaned haphazardly too. Yhe dishwasher was still running when we came in at 2:30PM (check-in was at 2PM), oven trays still had food crumbs on it and kitchen drawer still dirty with some food sediments. Worst, I tried contacting the host, they replied when wr already checked out and tried to justify the problem.